Give your hair an instant, extra strong hold with brilliant shine. L'Oréal Professionnel Infinium Lumiere Extreme Hold provides extreme instant fixing of a section or long-lasting overall hold to your hair. Our lightweight hairspray is especially created for hairdressers working backstage on fashion shows. Ask our backstage stylists, this is their essential for fixing a style in place. This means high fixation, an outstanding shiny finish and a dry formula without a stiff feel on the hair. Whatever runway trend you want to achieve, we have a hold level for you. Try Infinium Soft, for subtle hold and natural looking movement, our Infinium Extreme strength will give you ultra-strong hold with a shiny finish, trust us when we say that your style isn’t going anywhere. Infinium now comes in a mini handbag sized format, perfect for slipping into your handbag to fix your style in place throughout the day. 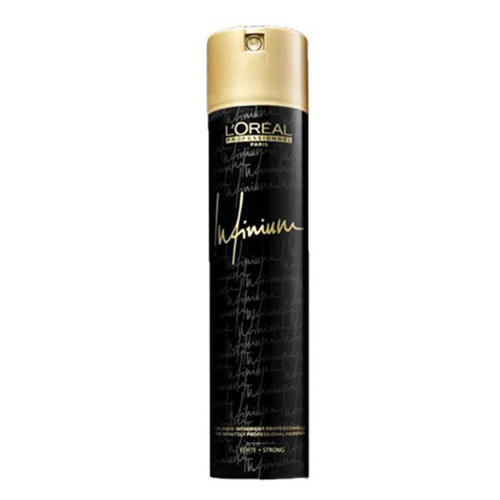 Use L’Oréal Professionnel Infinium Lumiere Extreme Hold on your dry hair. Spray it from a distance of about 35 cm. Alternatively, apply closer to accentuate a section.